While radon is present everywhere, and there is no known, safe level, your greatest exposure is where it can concentrate-indoors. And where you spend most time-at home. Your home can have radon whether it be old or new, well-sealed or drafty, and with or without a basement. Radon comes from the soil. Radon is produced from the natural decay of uranium that is found in nearly all soils. Uranium breaks down to radium. As radium disintegrates it turns into radioactive gas...radon. 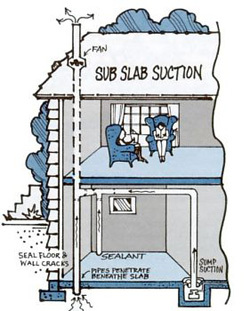 As a gas, radon moves up through the soil and into the air you breathe. How to protect you and your family from Radon. A number of steps can be taken to lower the amount of radon in a home. A quality radon reduction (mitigation) system is often able to reduce the annual average radon level to below 2 pCi/L. Experienced radon mitigation professionals (like Larkin is) are available and can install appropriate control systems.